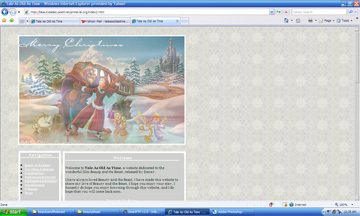 I was actually going to use this layout instead of the third layout on Tale As Old As Time. 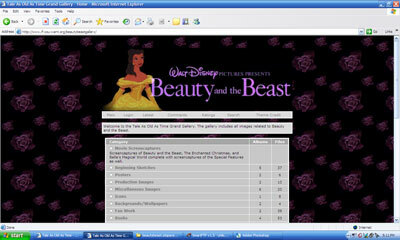 The layout is very similar to the third layout, but with a tables design and a header image. Instead, I worked with the header image and made another layout, but I kept the colors, background colors, and scrollbar colors and general appearance of the layout. I had also had floating stars that followed the mouse arrow, but sadly they did not work very well with the layout I designed afterwards, so I did not include them. I decided to make another layout for various reasons. I worked on this layout and felt that I would like to include a picture of it here. This layout was made after the one above using the header from the one above, and was used instead of the one above. This layout was not up for a very long time. I really do love it, but I want to use a Halloween-themed layout. A Halloween themed layout featuring Lumiere and Cogsworth. 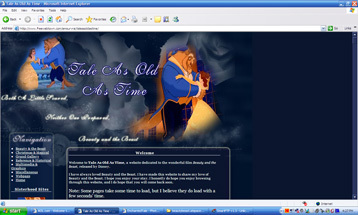 My most favorite layout, made to celebrate the special anniversary of Tale As Old As Time (1 Year) and Beauty and the Beast (15 Years). I love the banner, I didn't get to see it too much, but I still have it. 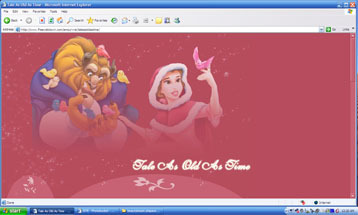 The Tale As Old As Time Christmas 2006 layout. A Valentines-Type Layout :D I didn't realize how much I loved this layout until I was going to take it down to make a new one. I didn't get to see it too often. A Spring Layout featuring Spring-like scenes from one of the Beauty and the Beast Marvel Comic Issues. I wanted to make loading time faster, so I made this layout without a background, although it is actually of a greater size than the layout that went after it (Layout 10). 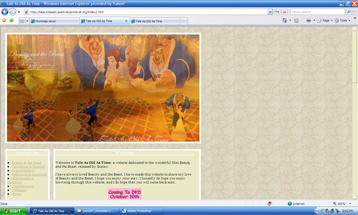 Another spring layout featuring a scene from Belle Reprise, where Belle sings before Philippe arrives. I blended two images in order to make the layout image a bit larger, so there were two sets of trees and mountains on the left. Belle could be seen in the right/bottom right. 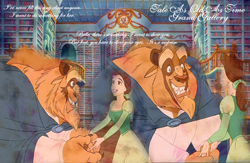 A green layout featuring scenes of the movie in a horizontal film style with the Enchanted Rose at the left. One of my most simple and favorite layouts, with no background image needed and my first successful image mapping layout for the website! A Halloween themed layout featuring the forest and bats in the trees that are seen when Maurice and Philippe are on their way to the Fair. Also a semi-Halloween or Fall-themed layout featuring the stained glass image of Beauty and the Beast from Kingdom Hearts. 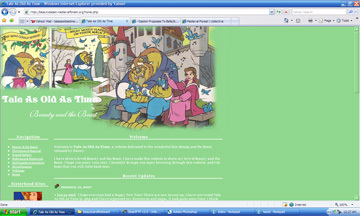 A layout made to celebrate the 16 year anniversary of Beauty and the Beast and two year anniversary of Tale As Old As Time. This layout was up for some time because I really like how the blend came out and especially because my boyfriend complimented me on it. These are skins that were used after some time along with Layout 14, one of the main reasons being that I didn't want to take off Layout 14. I finished my school year and decided to clean up the website a bit, and I made a new layout as well, trying out a new navigation system and a different font. 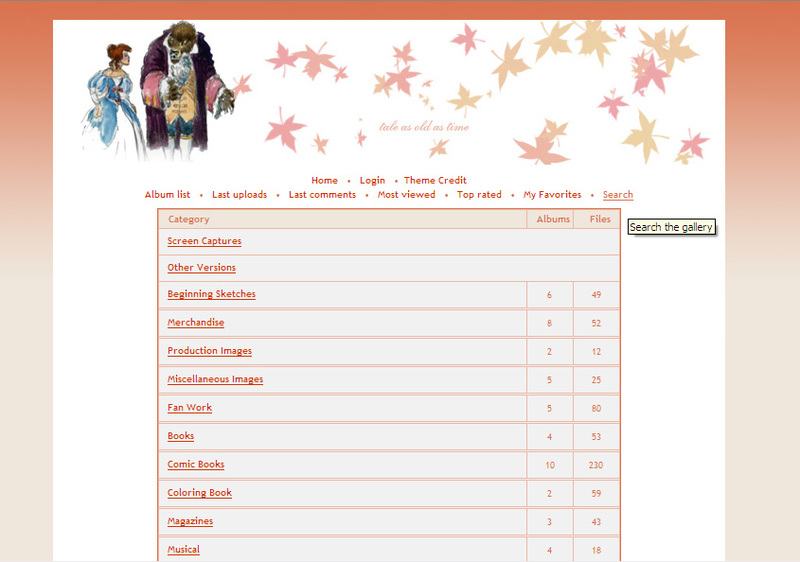 This is the layout or appearance of the coppermine gallery I had. Because of the move, I was no longer able to run a coppermine gallery, and placed this image here for historical purposes. 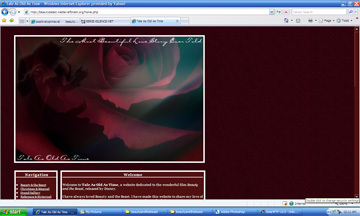 This layout was located on my first gallery at if-you-want.org. I don't have a complete preview for this layout but the image managed to be saved. The theme was green and light green, with this image as a header, and if you click it you can enlarge the picture. 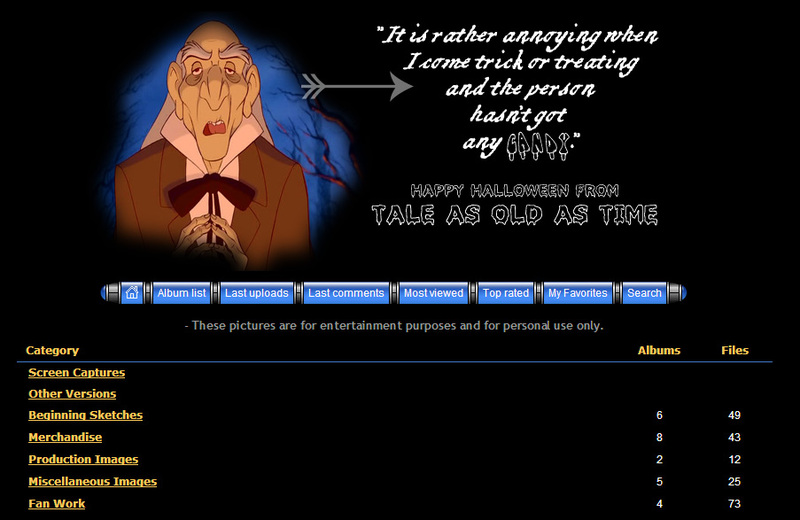 This is a Halloween themed layout featuring Monsieur D'Arque for Halloween 2007. 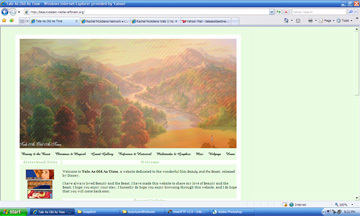 This is a Fall themed layout featuring concept art.